The decking and coping around your pool are a major component in the design of your overall outdoor living space. We spoke to top manufacturers to get the details on some new and innovative options. 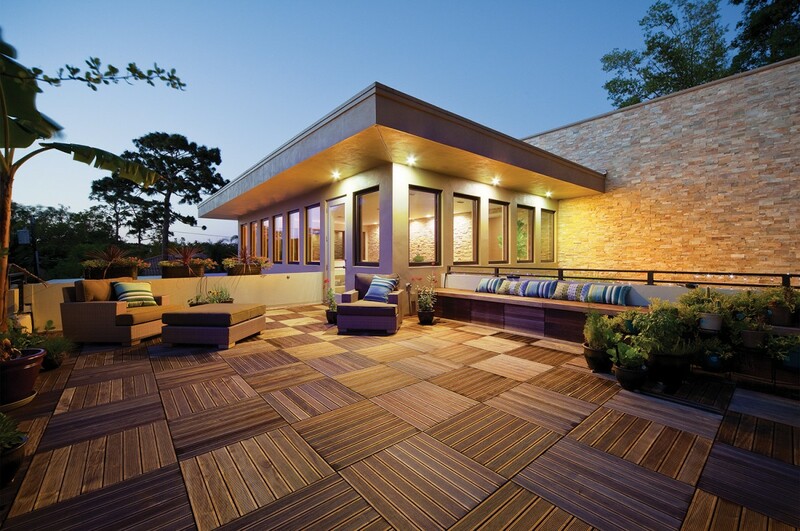 Versatile outdoor flooring by Florim USA can resemble natural stone, wood, or concrete. Florim USA recently launched its line of 2cm porcelain tile, a highly durable and versatile outdoor flooring product that can be made to resemble natural stone, wood, concrete, and other materials, allowing for a lot of design flexibility. “Using multiple sizes to create unique patterns for driveways, pool decks, and patios enhances the overall aesthetic,” says Jana Manzella, private label, key accounts, and marketing manager of Florim USA. Regarding trends, Manzella expects to see a lot of natural stone looks this year, especially gray stone. Bison Innovative Products wood tiles contain a variety of graining and colorations. Ipe has been Bison’s most popular wood tile over the past five years, but “species like cumaru, garapa, and mahogany give customers an array of colors and finishing options,” making them more popular lately,” says McClaugherty. Bobé Water & Fire’s grass edge system. If you’re looking for pool coping options, Cardinal Systems, Inc. manufacturers a reusable, decorative cantilever form product for pool builders. “Homeowners can choose from seven different styles/edges,” says Creative Brand Manager Lynn Gano. “Unlike pavers, this system allows for a custom decorative edge to a concrete deck.” Gano foresees textured cantilever edges and deck stamping as the main trend in pool coping this year.